Although for a long time forgotten Myśla is one of the most beautiful rivers in Poland which runs several kilometers north of Kostrzyn. For several years, rafting on its waters has been appreciated by hundreds of canoeists as a true feast for the eyes. It is an easy trail as the current is slow, with varying degrees of difficulty associated with the number of obstacles (fallen trees) in the mainstream. 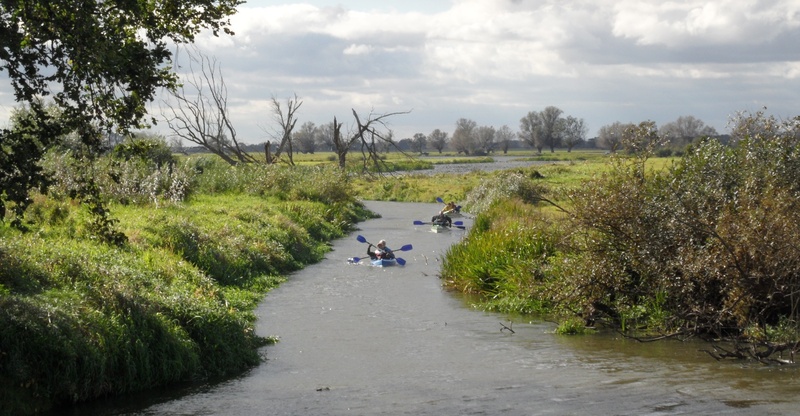 Most of its sections are suitable for beginner kayakers. In times of drought there may be a problem with small amounts of water and the overgrowing bed in the upper reaches of the river (from the village Mystki). A more difficult, but also one of the most beautiful and still navigable for less skilled canoeists is the section between Reczyce and Namyślin. There, the current accelerates, and the riverbed is full of fallen trees and boulders. The most attractive section in terms of landscape is the one between Mostno and the mouth of Myśla falling to the Oder. Myśla picturesquely eats away the banks, flowing into a green tunnel of plump beech forests, with mysterious oxbow lakes to the sides that tempt one to leave the mainstream. In Dargomyśl, two arms of the river embrace the charming nineteenth-century mill complex consisting of two buildings. A small hydro power plant operates in one of them. In the lower rooms, a historic mechanism of the nineteenth-century mill has been preserved, along with a system of heavy steel gears. Behind the mill there is an islet where you can instantly launch your kayaks. The duration of a leisurely trip through the section Mostno–Chwarszczany is about 7-9 hours. You can shorten it by two hours if you end the tour in Dargomyśl. Another charming stretch, Gudzisz–Chlewice, begins at the historic hydroelectric plant in Gudzisz, dating from 1922. After 2 km, the river flows into a small dam lake, constructed for the needs of another small historic water power plant in Reczyce. Below Dargomyśl, the river cuts into the edge of the Oder valley, starting the gorge of Myśla. The river now falls from the Gorzów Plain into the Freinwald Valley at an altitude of 30-40 meters above sea level, flowing into the Oder River that is elevated only 9 meters a.s.l., which is why the current of Myśla speeds up so much on the section Dargomyśl–Namyślin. The current, however, slows down in several places, due to the dams of water power plants. The steepest, tallest and most picturesque at the same time slopes of the gorge were carved by the water below the power plant in Gudzisz and Reczyce. In the riverbed, some large stones can be seen. Canoeists can, therefore, expect the trip to feel like one along a piedmont river. Halfway between Reczyce and Namyślin the river again slows down, because here starts the so-called “backwater stop” of the Namyślin water power plant. Rafting on Myśla from Gudzisz to Namyślin takes about 4 hours. Getting to Chlewice and Porzecza (with 1.5 km on the Oder) – another 2 hours. The entire trip is particularly charming. During the spring, water level rises, the Oder floods the meadows surrounding the last kilometers of the stretch (if you wish to end your trip in Porzecze), until you reach the sandy dunes of the Ecological Park Porzecze. A trip during this time of the year will surely be unforgettable.